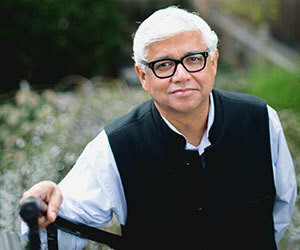 Amitav Ghosh, acclaimed Indian novelist and public intellectual, will deliver the 23rd annual Hesburgh Lecture in Ethics and Public Policy at 4 p.m. April 4 (Tuesday) in the Jordan Auditorium, Mendoza College of Business, at the University of Notre Dame. Ghosh’s lecture, “War, Race and Empire in the Anthropocene: Some Occluded Aspects of Climate Change,” will examine how the discussion of climate change — being largely centered in Western universities — has skewed the discourse in certain directions with predominantly economic characterizations of problems and technological solutions. Ghosh will propose other constructive frameworks with which to approach climate change. Ghosh was born in Kolkata (formerly Calcutta) and grew up in India, Bangladesh and Sri Lanka. He is the author of “The Great Derangement: Climate Change and the Unthinkable,” a work of nonfiction, and several novels, including “The Circle of Reason,” “The Shadow Lines” and “In an Antique Land.” Ghosh’s work has been translated into more than 20 languages and won such awards as the Arthur C. Clarke award, the Crossword Book Prize and a Man Booker Prize shortlisting. His essays have been published in The New Yorker, The New York Times and The New Republic, among others. “The Kroc Institute is delighted to partner with the Department of English and the Liu Institute in welcoming Amitav Ghosh to deliver this important annual lecture,” said Ruth Abbey, interim director of the Kroc Institute for International Peace Studies. The Kroc Institute for International Peace Studies established the Hesburgh lectures in 1995 in honor of the Rev. Theodore M. Hesburgh, C.S.C., the late president emeritus. Each year, a distinguished scholar, policymaker and/or peace advocate is invited to deliver a major lecture on an issue related to ethics and public policy in the context of peace and justice. This year’s Hesburgh Lecture is co-sponsored by the Department of English, Liu Institute for Asia and Asian Studies, the Henkels Lecture Fund, the Institute for Scholarship in the Liberal Arts and the College of Arts and Letters. Past Hesburgh lecturers have included Bill McKibben (2016), author, scholar and environmentalist; Ebrahim Rasool (2014), South Africa’s ambassador to the United States; Amartya Sen (2012), 1998 winner of the Nobel Prize in economics, Lamont University professor and professor of economics and philosophy at Harvard University; Shirin Ebadi (2009), 2003 Nobel Peace Prize laureate, lawyer and human rights advocate in Iran; and U.S. Rep. Lee Hamilton (2005), former vice-chair of the National Commission on Terrorist Attacks and former chairman/ranking member of the House Committee on Foreign Affairs. The Kroc Institute is an integral part of Notre Dame’s new Keough School of Global Affairs. Originally published by Amanda Skofstad at news.nd.edu on April 03, 2017.